ZOOT is the largest Czech online fashion store. It also operates in Slovakia and Romania. It was ranked 43rd in the prestigious list of the fastest growing European companies published by English newspaper Financial Times. In 2016, sales reached 706 million Czech crowns (over €27,000,000). ZOOT had prepared a complete redesign of the site. Changes included graphics, URLs and, partly, content. The client was afraid of a loss of traffic from unpaid searches on Google and on local Czech search engine Seznam. Our goal was to minimize any drop. After the redesign, we continued working together to take care of the SEO for the Czech and Slovak version of the e-shop. In comparison, before the start of the collaboration and now, sales from unpaid searches for ZOOT.sk and ZOOT.cz increased by almost € 1.5 million a year. Of that, revenue at ZOOT.sk increased by around € 300.000. It considered the last click attribution, where we discarded sales coming from phrases containing the word “ZOOT,” thus the landing page was not a homepage. Traffic to the Czech version has almost doubled, and the Slovak version has up to three times more traffic than before the start of the collaboration. Lucie Zaloudkova, the client: Thanks to our cooperation with Spotibo Agency, we were able to solve two major tasks in ZOOT. They helped us with successful managing of site redesign to a new platform and with setting a roadmap for the continuous site optimization, including regular SEO monitoring. We connected with ZOOT thanks to a recommendation from Linda Appeltauer, who previously worked with our colleague Janko at H1.cz marketing agency. Linda has years of experience working with SEO, so she knew exactly what to expect from the redesign, and she also knew Janko’s working style. We prepared an opponent analysis for the upcoming version of the site. The new site was internally referred to as the 3.0 version (original was 2.0). Even before redesigning, we had to tune it up from both the technical and content points of view. We’ve uncovered two major issues and three high priority issues. Most of the deficiencies concerned duplicate or similar content. If we did not solve them, the search engines would index thousands of unnecessary URLs that would receive value at the expense of more important sites. Each product size had its URL. In order to maintain the user-friendliness of the size selection directly on the category page, we decided to separate the size in the URL using the grid character. Characters behind the grid are not normally marked as a new URL by the search engines. In addition, we redirected the original URLs to new ones, and we also made changes in internal linking. If we hadn’t resolved this error, it would have been likely that a number of products would have been removed from the index, and search results displayed pages of different sizes of clothing than the searcher’s preferred size. This would result in a lower click-through rate in the search results. In this way, thousands of other duplicated pages were created. The impact would be similar to the one described above. We resolved it again by changing internal linking and redirecting. On ZOOT, there are about 10 types of pages (product, category, …). We reviewed content factors for each of them: subtitles, titles, meta descriptions and other content. Where content had not been properly generated, we’ve designed adjustments to place keywords in the content. And so, they were not too different from the content in the earlier 2.0 version. The original site (left) vs. the new site. In addition to the redesign from 2.0 to 3.0, we needed to go from the http protocol to secure https. Since the Czech market is the key for ZOOT, we decided to change the Slovak version first, where we tested it all. Because we were targeting only one search engine and didn’t change any content on the site, the risk of traffic drop was low. Here we saw a greater risk, especially in the Seznam search engine, as we knew a few failed examples from the past. The most risky change was due to changes to URL, graphics and content. The Slovak and Romanian mutations were only waiting for a protocol change, so it was trivial. We redirected all URLs using the 301 status code to the https version. The Czech version was waiting for the change of tens of thousands URLs that were on dozens of different subdomains. The situation made it even more complicated, because categories had their own subdomains. https://www.zoot.cz/saty-sukne or https://kabelky.zoot.cz/ redirected to https://www.zoot.cz/kategorie/17556/zeny/kabelky-batohy-penezenky. We had been monitoring if Google sent users to error pages (404) due to a redirect error. We also tracked down on any type of site if there were no positions drops or indexing problems. Even if you test an upgraded site thoroughly, only the sharp version shows if there’s any problem. In the case of the CZ version, the problem occurred. And it was not just one. Problem 1: Collabim warned us of a drop of fashion brands. Showcase the trend of fashion brand positions at ZOOT.cz on Google. The Google Analytics data confirmed that positions had fallen in real terms, as traffic to pages with brand names (e.g., Dorothy Perkins brand) had fallen, too. It was caused by the fact that, unfortunately, we missed a bug left after redesigning the “noindex” tags. Due to the fact that we quickly noticed the problem and eliminated it, the decrease of traffic only took a few days, during which ZOOT.cz traffic dropped from search engines by a few percent. 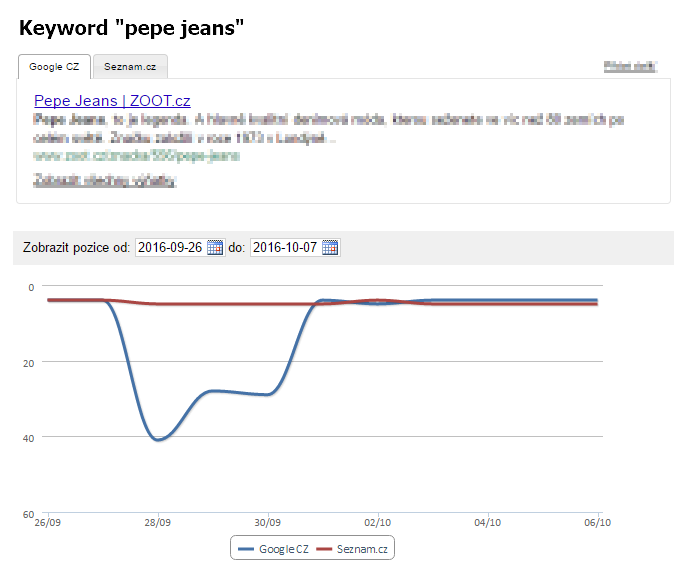 Showcase of position development on the phrase “Pepe Jeans”. Problem 2: In Seznam search engine, URLs with http protocol had been fetching for more than a month. Seznam had a problem with the homepage and some main categories. In search results, it still showed the http version of the URL, even though it was redirected by the 301 status code. In the past, ZOOT.cz had 302 redirects from https version to http. Then Seznam got confused, so it continued to display the version with http. And the mystery was solved. At ZOOT, they began to advertise on-brand phrases that had a huge share on traffic. When users started clicking on PPC, it wrinkled significantly with organic search traffic. While it turned out that traffic did not come from search engines and is not an SEO-related issue, we immediately informed the client about the suspicion that we detected as a result of monitoring. That’s why the problem was resolved the next day. Sometimes, we had a lot on our plate, but finally, the results were better than even expected. After migration, there was almost no decrease. On the contrary, the site has been performing better and better in search engines. Year-to-year comparison of Google traffic. After migration, traffic decreased for several days. Then it started growing on Google and on Seznam in a year-on-year comparison. Zoot.sk comparison of organic traffic before and after migration. ZOOT is an ideal project for successful SEO. They have a team of clever marketers, copywriters, and they are powerful in web analytics. This is the main reason why they are doing great. Our task is to push and direct them in some things, and to be alert to possible problems. We need to have an overview of what’s happening in the project, and others need to have an overview of SEO. It has been a great challenge for us to manage this project. And it still is. In the past, we were very speculative how to handle all our tasks, so we experimented with specialized tools, and we tried to work with gantt chart. And the result? We use a simple spreadsheet in Excel and Basecamp :). Color indicates status of the tasks and who is in charge of it. We check the roadmap around once a month. We monitor whether we have forgotten something, and the roadmap helps us with long-term capacity planning. We solve details of SEO tasks using the “to-do list” in Basecamp. We receive notifications in Basecamp about new changes on the site. We send each other info about PR activities as well. In the link building processes and PPC, we still have a lot to improve. We are currently working on ad-hoc consultations, exchanging materials. With some marketers, we’ve done a workshop on how to get more backlinks, thanks to marketing. Link building or technical SEO will not be described in this case study. This is either because of a misuse or traditional SEO practices that you may know. We may, however, post some hints over time. For ZOOT, we’ve produced about 20 shorter keyword analysis. Gradually, based on potential profitability and other priorities, we chose the client fashion categories for optimization. We did not have any extensive analysis that ended up in the socket for its complexity. Some types of products, such as dresses, are so widespread that it is hard to deal with them in a single category. In their optimizing, we ran out of about 35,000 keywords. The most valuable source of phrases are our internal search, Search Console search phrases and PPC data. We are also very helpful with data from keyword suggestion from Sklik. We also use it for the needs of the Slovak market. a) A proposal specifying exactly what to do. Often, there is some form of table in Excel, where it is specified which categories to create, edit and what keywords to use. b) Source data with which the client can work further. 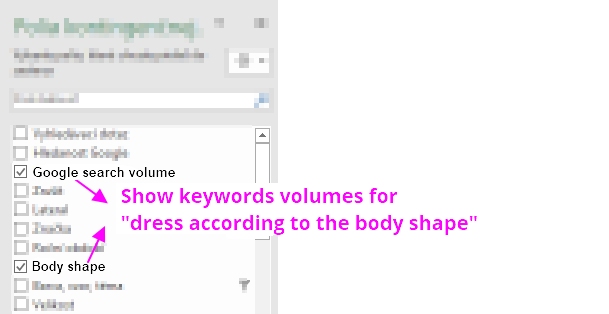 We usually have keyword data in Excel, and manipulate with a pivot table. Illustration image, number of searches does not reflect reality. We are not experts in fashion, so reminders from the client are very important. In ZOOT team, they work hard, they drill in our data and have suggestions for any improvements. However, we often speculate on what phrases to actually use and where. Thus, a user searching for a keyword may have a different intention than the phrase actually means. Or, he has a different intention than we think. For example, take the phrase “elegant dress.” Does a customer want to buy only a nice dress for work, or is she looking for a formal dress? There are hundreds of such examples. After incorporation of changes, we double-check everything we’ve done. Content changes are then evaluated. Every month, we do a so-called “KPI Report“, where we can see even more details, such as where the site progresses and where it stagnates. This is how we do most of the keyword analyzes for ZOOT. Their results have an impact on the content of categories, products or tags. They also affect changes in category titles, their structure and filtering. Compared to the beginning of the cooperation and now, sales on ZOOT.sk and ZOOT.cz (organic non-brand) have been growing by almost €1.5 million a year. Of this, revenue at ZOOT.sk increased by about 300,000 EUR. Even if we are the SEO specialists here, ZOOT team has the greatest credit for their success. They’ve realized our recommendations in link building, content and so on. Very likely, they would grow in SEO, even without our help. We are very pleased to support this growth, because working with the ZOOT team is just amazing. What lessons gave us cooperation with ZOOT? We’ve improved our internal processes while migrating the site. Nowadays, we check possible indexing issues for each page separately. It is not enough to check out a few pages. We have improved processes in the ongoing monitoring of the project technical state, which is constantly changing. We already know that if we solve a technical problem very quickly, it usually has no impact. However, if the problem persists for weeks, any drop may take months. We learned a lot about managing large projects. This is thanks to Lucie Žaloudková, one of the best project managers we have ever worked with. Do you need help with SEO as well? Get in touch with me at janko@spotibo.com. We won’t send you anything else than SEO tips. You can cancel subscription anytime.